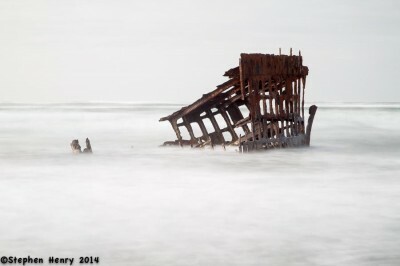 In 1906 the barque Peter Iredale ran aground on the beach at what is now Fort Stevens State Park in Oregon. She was on her way from Mexico to the Columbia River to pick up a cargo of wheat but was driven ashore by a sudden squall. No lives were lost, and the Captain was exonerated of any fault. The wreck was sold for scrap and all that remains is this bow and other bits of iron on the beach. In time, the wreck has weathered many storms, and rust is claiming her structure. Influenced by mid-20th century photographers such as Wynn Bullock and Minor White, I have been attempting to get away from making images of things, instead making images of ideas and change. I like to work with the idea that time is not necessarily linear, but rather can be at least warped, and maybe even circular. Instead of making this image in the usual fraction of a second, I used a much longer exposure. This technique blends the waves and smooths their rougher edges in the passage of time. If we were to mull over the idea that time is not so linear as we suppose, perhaps we could see the Iredale sail again. This digital photograph was made on an overcast evening during a rising tide. The equipment used was a tripod-mounted Canon 5D Mark III with a 24-105 zoom lens at 105 mm. The exposure was 10 seconds at f22, ISO 50. Enhanced in Adobe Lightroom.